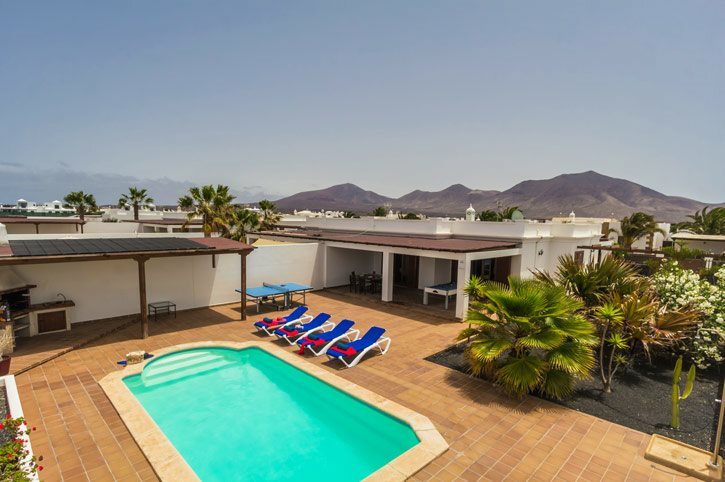 With a sleek and bright interior and a spacious pool terrace, Villa Tierra makes an excellent choice for your Lanzarote villa holiday! The sandy beach of Playa Dorada , shops and restaurants are all within a 20 minute walk or a 5 minute drive. The charming old town of Playa Blanca and fashionable Rubicon Marina are also nearby and well worth a visit! Air conditioning/heating in the bedrooms, heated pool and WiFi are included in this 3 bedroom villa. A spacious outside area, delightful interiors and a great location, just a short drive from the centre of Playa Blanca - perfect! The spacious outside area is dotted with plants and has a long covered pergola providing shade from the Canarian sunshine. There is plenty of room for sunbeds around the swimming pool and a brick BBQ for dining alfresco by day or night. A tall wall around the terrace and pool also gives a sense of privacy. This villa has an off-road parking area and entry is up a shallow step and through a gate. The pathway leads to another step up to the front door. The bright, open plan lounge/dining area lounge is comfortably furnished with sofas and a table seating 6. Patio doors lead out to the covered terrace and pool area. The kitchen is fully equipped with all modern appliances and leads through to the utility room. There are 3 bedrooms in the villa - 1 double, 1 twin and 1 single. The double bedroom has an en suite bathroom and doors leading out to the terrace and pool area. The twin bedroom and single bedroom share an adjacent shower room. All bedrooms have wardrobes. Villa Tierra is located in a residential area, close to the Sun Park and Sun Tropical hotels. It's only a 20 minute walk to the sandy Playa Dorada beach and the old town of Playa Blanca. Here there are a great choice of shops, bars and restaurants to sample. The fashionable Rubicon Marina is within a 5 minute drive and is well worth a visit. A coastal walkway, ideal for strolling or cycling, takes you past the Rubicon Marina with its designer shops, French bakery, swimming pool, gift shops and much more! There is a market held every Wednesday and Saturday where you can find crafts, jewellery, arts and books. In the centre of Playa Blanca many shops can be found too. The old town of Playa Blanca is easily reached on foot from this villa and has a good selection of cafe bars and restaurants overlooking the sea. The main avenue hugs the coastline and is dotted with small sandy bays flanked by restaurants. You can enjoy lunch at one of the tapas bars, including typical Canarian food or, by night, visit the live music venues.. The Playa Blanca harbour also enjoys various tapas bars. This villa is a 20 minute walk to the Playa Dorada and Princesa Yaiza beaches. These pure white sand and crystal water beaches are ideal for families to swim and snorkel. Venture even further and the stunning beaches of Papagayo await you. Take a picnic, find your own cove and soak up the Canarian sunshine on these natural beaches with the volcanic landscape in the background. From the Playa Blanca harbour, you can take a ferry to the neighbouring island of Fuerteventura, which is great for a family day out. Alternatively, book a catamaran or fishing trip here. A coastal walkway, ideal for strolling, takes you past the Rubicon Marina where you can watch great sunsets. The National Park of Timanfaya is probably the most famous place in Lanzarote. Take the journey through the Luna route passing some of the largest craters and the valley of tranquillity to fully appreciate the natural energy that has shaped the island. Jameos Del Agua is the only place in the world that you will see the blind albino crab living in the lagoon. A place of sheer peace and tranquillity! Playa Blanca is very popular with anyone wanting to try something more active and hiring bicycles is an easy and a popular way of exploring the local area. Villa Tierra is not available to book for season as it is sold out. Take a look here at the Lanzarote villas that are currently on sale.